Flotsam & Jetsam have garnered their fair share of public and critical praise throughout their three decade career. That said, their record sales haven't reached the kind of numbers their thrilling output justly deserves. In 1986 the Arizona thrash unit released 'Doomsday For the Deceiver' which found a healthy following in the underground but the band lost bassist and songwriter Jason Newsted to Metallica after the death of Cliff Burton. The band recovered, and armed with a major label deal from Elektra Records entered the studio to work on their sophomore album. 'No Place For Disgrace' was the sound of a band that set out to prove to the world that they were a deadly force to contend with. Songs like "Dreams of Death" and "Misguided Fortune" seethe with intense fury but cut through with air-tight precision. Eric AK's vocals went from a paint-peeling scream to a low end howl consistently showing us he's been one of the most underrated vocalists in all of metal. Check out how he hits the skyscraper high notes on the chorus of "Hard On You" for further proof. With 'No Place For Disgrace' Flotsam & Jetsam cemented their place amongst the heavy hitters of the day. Even listening to the album over 20 years later, the material has the same bite it did back then. In this Noisecreep exclusive, we spoke with founding member and former drummer Kelly Smith about the making of 'No Place For Disgrace' and his feelings about everything that happened around it. He also comes clean and apologizes to Alex Perialas who worked with Flotsam & Jetsam on their next album for things Smith said years ago in another interview. 'Doomsday For the Deceiver' was an underground success. Elektra Records signed you, and you had a big management firm behind you. What kind of expectations did the band put on itself heading into the studio for the 'No Place For Disgrace' recording sessions? Well let me start off by saying we didn't have a big management behind us. They managed Megadeth and they got most of the attention. They were careless and for us it was a last minute thing in order to get us on a tour and signed to Elektra. We could have made other choices that were better for our future. When I try to recall those times, I had more or less stepped into the position of point person for the band since Jason (Newsted) had left. So my expectations were to stay with the pack... Metallica, Anthrax, Metal Church and others at the time. After 'Doomsday For the Deceiver' got the reviews it did there was a lot of pressure to create another epic. Of course it could never equal the initial impact like 'Doomsday For the Deceiver' had on the world. So it was unrealistic at best. There was also a wall that was built by the Metallica camp to make us smaller than we were so Jason could look big enough to fit into Metallica. All ad/interviews claimed that Jason was Flotsam and more of less we were lost without him. I think their plan worked. No matter what we did, how we wrote or played live we would become the band Jason left for Metallica. My goal was to break that stigma, overcome it. How much of the material was already written and demoed before you went in to record the album? If I remember correctly we had about 90% ready to go. "The Jones" was created in the studio. Our process as many others is an evolutionary one. Every stage of the creation process brings a refinement to the songs all the way until it is tracked. Things never turn out the way they were originally written. Did anyone in the band have to fight to get a specific song onto the album? Are there any songs floating out there that you recorded but didn't include on it? No other songs I can think of. We had some songs that were created with Mike Spencer (bassist who took over for Newsted) prior to being relieved of duty. We didn't want to include songs from him since he was leaving. Troy (Gregory) was fairly new so we wanted him to work in the band for a bit before adding songs to a record. In terms of style, the album reaches wide. You have straight-up thrashers like the title track and "N.E. Terror" but you also have epic stuff on there like "Escape From Within." That said, the Elton John cover ("Saturday Night's Alright for Fighting") seemed a little forced. There was speculation within the underground that the label wanted you to do that song. Our manager at the time wanted us to do a cover. Megadeth had done a few so their plan was for us to follow their path. We all grew up with Elton John, and the song fits us. Management had other ideas and wanted us to do an MC5 song but we chose Elton. During the making of the album, the PMRC and other conservative groups were attacking heavy metal and rap for its lyrical content. The song "Hard On You" seemed like a reaction to that. Yup – we were dead against anything they had in mind. It was an overreaction and also it was an abuse of power in government. What the PMRC was and is, is "BIG MOTHER," a baby sitter for parents who don't want to pay attention to what their kids are doing. More or less it's a tool to blame someone else for not being responsible for their kids. So blame it on the music, but don't ever own your part in your kids life. How much time did you spend in the studio recording 'No Place For Disgrace'? There seems to be an urgency in the performances that lends itself well to the material. I am not exact on this but when all said and done about two months or so. It may have been a need to get the record out to stay on track, not be out of the loop too long. Listening to the album now, what sticks out to you? Are you happy with the way it sounds sonically? No, we struggled a lot with our mixes through the years. This one sounded better before we mixed it. Bill Metoyer is a great engineer. We believed in him. We were looking for a major label sound. We liked the 'Master of Puppets' sound and thought Mike Wagener would be a good choice for it. We had a lot of trouble getting our point across in the sound and Metoyer was not hired to speak for us so he was with us in not being able to get Wagener to mix to our specs. This was our first record with Elektra so our budget was small. We should have just kept Bill and sent Mike packing. 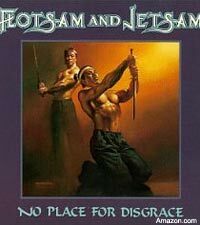 Of all the Flotsam & Jetsam albums you've released so far, which would be the most popular one with your fans and which one do you think is the most misunderstood? 'No Place For Disgrace' seems to be the fan favorite. But sales wise it doesn't seem to show that. The most misunderstood album that I was a part of was 'When the Storm Comes Down.' I, like many others, had focused on the music and playing on the record but the lyrics that Troy Gregory had written were very wordy and strange. Troy was into a different vain of music... more obscure and dark. There was a lot of turmoil in and around that record. Troy was starting to wear on some of us and the tension was growing. We also decided to be a guinea pig for a digital mix. Our A&R guy was big on digital mixing. Alex Perialas had never mixed under digital as well. We all agreed to it, meaning five band members, management, A&R and engineer. We all liked the mixes when we left the studio. Something changed somehow between mix down and mastering but the fullness had changed. No one knows what happened or how. The amount of people who knew the technology for digital was still pretty low and the one thing that we all knew was the warmth in the sound goes away in a digital environment. Analog sound travels in a wave format. Digital is in a data format which is rigid like a stair case if you looked at it. So bits of the true sound get lost. I think the title of the record explained the times for us. Internally we were no longer together as a band, separation was beginning to happen. Let me mention something that I greatly regret ever saying about a good friend of mine. I made a very arrogant and offhand comment about Alex Perialas ('When the Storm Comes Down' producer) in an interview I did back in the 90s that caused him harm. I hope in your article you will add this as it needs to be a public acknowledgement of my wrongs done to him by me. Alex is a great engineer and a great person. He made legendary records with the likes of Anthrax, SOD, worked on a lot of the Megaforce Records collection and even Metallica. My comment stated that he was a high paid knob twirler and I discredited his producing capabilities. I was trying to cover up the fact of what really happened which was we all made the decision as a band to accept what we heard in the studio. MCA Records (their label at the time) and others had put him in a position to do what they wanted. He didn't want to mix digitally as much as we didn't but MCA did. They were paying so we did it. Alex is a great producer and was a great friend and provider for us before, during and after that record. He opened up his home to us and invited us into his family. I am deeply saddened by my comments. I wish to right this wrong with him and to anyone else I may have harmed as well. He was, and is, loved by many. When I had reconnected with him I had no idea I even said that in an interview. I was shocked and saddened. I was terribly wrong. I have no other way to right this than to own it in a public forum. It was all me and only me that caused the harm.